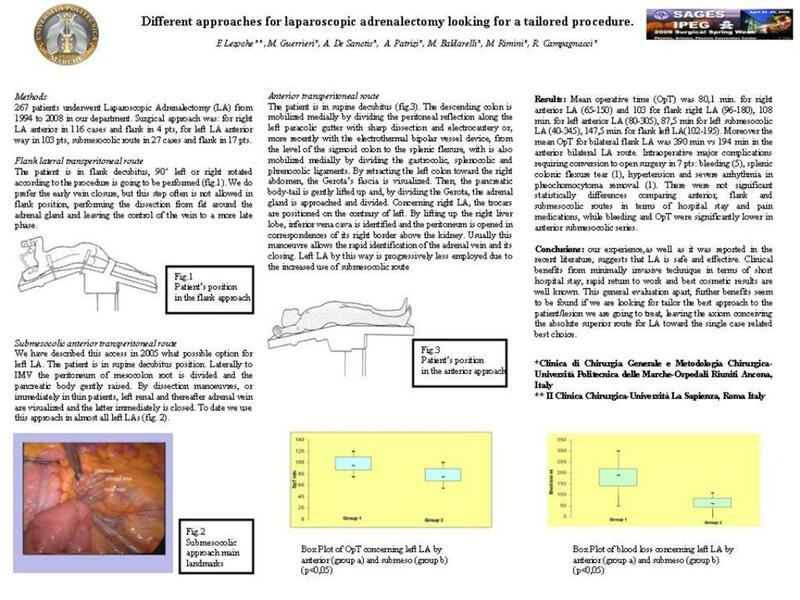 Aim: to report our experience in laparoscopic adrenalectomy (LA) through anterior, lateral and submesocolic approaches . Methods: 267 patients (pts) underwent LA in our departments. The choice of the surgical route was based on patient (BMI, previous abdominal surgery) and lesion features (size, side, secreting mass, suspect malignancy). Dissection and coagulating technology did change over the decade, shifting for monopolar cautery to electrothermal bipolar energy device. The submeso way, we first described in 2005, was reserved for left lesions not larger than 6 cm. Finally, the approach for right LA was anterior in 116 cases and flank in 4 pts. Left LA was performed by means of anterior way in 103 pts, submesocolic route in 27 cases and flank in 17 pts. Results: Mean operative time (OpT) was 80,1 min. for right anterior LA (65-150) and 103 for flank right LA (96-180), 108 min. for left anterior LA (80-305) and 81,5 min for left submesocolic LA (40-345). Moreover the mean OpT for bilateral flank LA was 390 min vs 194 min in the anterior bilateral LA route. One intraoperative death occurred in a left LA for pheochromocytoma flank approached. Intraoperative major complications requiring conversion to open surgery were observed in 7 pts: bleeding (5), splenic colonic flexure tear (1), hypertension and severe arrhythmia in pheo removal (1). There were not significant statistically differences comparing anterior, flank and submesocolic routes in terms of hospital stay and pain medications, while bleeding and OpT were significantly lower in anterior submesocolic series. This positive trend was particularly noteworthy in the last year series.